It might just be difficult to know which is worse, the unrelenting breeze that annoys you when you try to watch your favorite TV program, the size of your electricity bill due to that ever-cycling heat pump or the noise from neighboring rooms. Anyway, something has to be done! Why not try a draft stopper? Use Appleberry Attic draft stopper as a way to save energy. With our door and window draft stopper, you can save up to 25% off your heating bill as well as improve the efficiency of your air conditioning, thereby reducing your electric bill by similar savings. Appleberry Attic unfilled draft stopper is a small investment, but a significant way to conserve energy and save money year round. It's a proven insulation method without spending a lot of money. Our draft stopper will get the job done by fitting snugly under the open spaces below the door or window. They are easy to install and can be removed when needed. Quality material: Appleberry Attic unfilled Door Draft Stopper is constructed of insulating material that is nice, thick and really well sewn. The Velcro end is extremely secure and it will have no problem keeping the fillings perfectly sealed with a strong hold. It will not leak! Each draft stopper measures about 2 1/2"H x 36"L when filled. Effective: Achieving an energy efficient home means being able to set an optimal temperature and maintaining it. That cannot be achieved when drafts are coming in from doors. Our Door Draft Stopper will keep the outdoor air from coming inside. Keep heat in and cold out, blocks fumes and noise. Our door draft stopper easily fits standard 36-inch doorways and will work effectively on any kind of door including lanai outside doors. Economical: Although our door or window draft stoppers come unfilled; that does not mean excess spending. They can be filled with proven insulating fill, such as finely ground corn cob, sand, vermiculite, kitty litter, rice, dried beans or wheat (NOT INCLUDED). It is advised that the filing be flexible to maneuver tightly under your door or window. 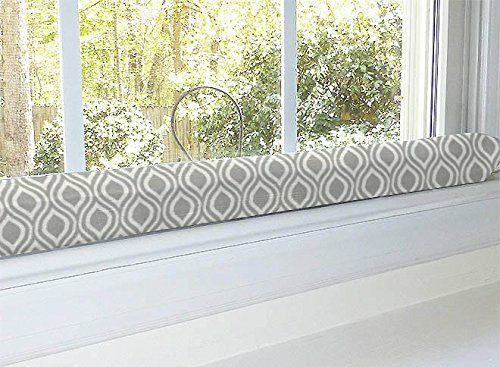 Easy to use and clean: Appleberry Attic window draft stoppers can be manipulated to fit in any awkward space; they are made of quality materials. They are very hard wearing and are easily cleanable. To clean, all you need to do is put filling in zip lock bags or pockets and slide in/out in for washing. Decorative: Our draft stoppers will not only help regulate the temperature and feel in your room; they also look great wherever they are being used.